For the last few years, I’ve put together a list of dates of festivals happening in the Chorlton area of Manchester. This year’s a bit trickier than normal because many of the usual suspects aren’t taking place, or they’re scaling back, or they’re just keeping their cards a bit closer to their chest. But where I have been able to find details, I’ve included them below. Here is the Chorlton Festival Calendar 2017. The Chorlton Big Green Happening, the successor to Chorlton’s Big Green Festival, isn’t taking place this year. This celebration of sustainable living was also known as the Chorlton & Whalley Range Big Green Happening when it last took place in April 2016 in recognition of the fact that activities were split between St Clement’s Church on High Lane in Chorlton and the Carlton Club on Carlton Road in neighbouring Whalley Range. Here’s hoping the festival returns in 2018. Chorlton Arts Festival is ringing the changes in 2017. The team behind the festival want to “create a more sustainable event and to work on new ideas to support artists, the local community and our creative programme” with a view to developing a bigger, better and more locally engaged arts festival. As a result, it’s running a scaled-down version of the Chorlton Arts Festival in 2017 while the Chorlton Weekender, the mini music festival within the festival proper, and possibly some other fundraising events won’t now take place until later in the year. Having said all that, there are still quite a few events planned in 2017 including a screening of classic vampire film Nosferatu with live organ accompaniment at St Clement’s Church, comedian Juliette Burton’s Edinburgh preview at the Lloyds pub on Wilbraham Road, and the tenth and final appearance of the Smallest Sculpture Park in the World on Corkland Road. Some events are free while others are paid-for. The annual VON Manchester Vegan Fair, or just the Manchester Vegan Fair for short, is moving to a new home in 2017. Formerly at the Chorlton Irish Club on High Lane, the 2017 edition is switching to a bigger and more central venue – Oswald Road Primary School. A host of family-friendly attractions are promised on the day including an outdoor stage, live music, stalls, film shows, a beer tent and of course vegan cuisine. Tickets are £3 while under-16s go free. The popular Chorlton Open Gardens event sees gardeners across Chorlton throw open their doors for one day only and all for a good cause. Members of the public typically pay £5 in aid of Freedom from Torture to buy a programme that includes maps and write-ups of each of the 30+ gardens taking part, which you can then explore at your leisure. The organisers are having a break this year but have promised that the event will return in the summer of 2018. For those who can’t wait that long, they’ve suggested checking out Burnage Open Gardens 2017 on Sunday, 4 June or Old Trafford Open Gardens 2017 on Sunday, 2 July. Beech Road has played host to a variety of festivals in recent years. First there was the Beech Road Festival which gave way to the more family-oriented Beech Road Family Fun Day and then in 2016 Living Local, a celebration of independents and shopping locally. Whatever it’s called, the event is traditionally held on the first weekend in July and free to attend. However, I’ve yet to come across anything to suggest that a 2017 edition is currently being planned unfortunately. The 13th Chorlton Beer & Cider Festival, more commonly known as Chorlton Beer Festival or just Chorlton Beer Fest, takes place once again at St Clement’s Church and is already shaping up to be a big one. Organised jointly by Trafford & Hulme CAMRA and St Clement’s Church, the 2017 festival promises to offer more than 200 beers and ciders. There will be around 100 draught beers served from cask and key-keg along with bottled beers from around the world and more than 50 ciders and perries. The event runs from 6pm – 1030pm on Thursday, 6 July, 6pm – 1030pm on Friday, 7 July, and 1pm – 930pm on Saturday, 8 July. Entry each day costs £10 which includes a souvenir festival glass, a festival programme with tasting notes for the beers, and a £4 beer and cider token. And if you really want to test your stamina, a new addition for 2017 is the introduction of a season ticket giving entry to all three days for £20. The biggest Guy Fawkes Night party in Chorlton traditionally takes place on Chorlton Green. Admittedly there isn’t an actual bonfire, or a Guy Fawkes effigy come to think of it, but there are some spectacular fireworks. A free event organised by the Horse & Jockey pub, Chorlton Bonfire Night typically involves two fireworks displays, one at 630pm for kids and one at 9pm for adults. You can usually expect to find a couple of outdoor stalls doing a roaring trade in beer, hot drinks, barbecued meats, festive favourites and so on – or you can duck inside Horse & Jockey to try the beers from the pub’s onsite brewery Bootleg Brewing Co.
Update: The Horse & Jockey pub has announced that it will not be hosting a fireworks display this Bonfire Night because of safety concerns. On its Facebook page, the pub said: “With regard to Bonfire Night 2017 at the Horse & Jockey, we have been working closely with the relevant local authorities and also our health and safety advisors. “This event started out as a small community event and has grown significantly over the years Following advice and detailed consultation with all relevant authorities we have sadly concluded that the Horse & Jockey will not be hosting a fireworks event this year on Bonfire Night. The main factor of this decision being specifically the safety and welfare of the increasingly large numbers of people attending. Update 2: The Lead Station pub, the Chorlton Fireworks shop and West Didsbury & Chorlton AFC have teamed up to organise a replacement fireworks display. Chorlton’s new fireworks display will take place at the Recreation Ground off Brookburn Road in Chorltonville on Sunday, 5 November 2017. The 13th edition of Chorlton Book Festival will take place at the end of November. Details of what’s being planned for the 2017 Chorlton Book Festival haven’t yet been released, but based on previous years we can expect a range of events in Chorlton Library on Manchester Road as well as various other venues across Manchester’s most literary suburb. Events typically include poetry slams, author readings, literature talks, writing workshops and a literary pub quiz. 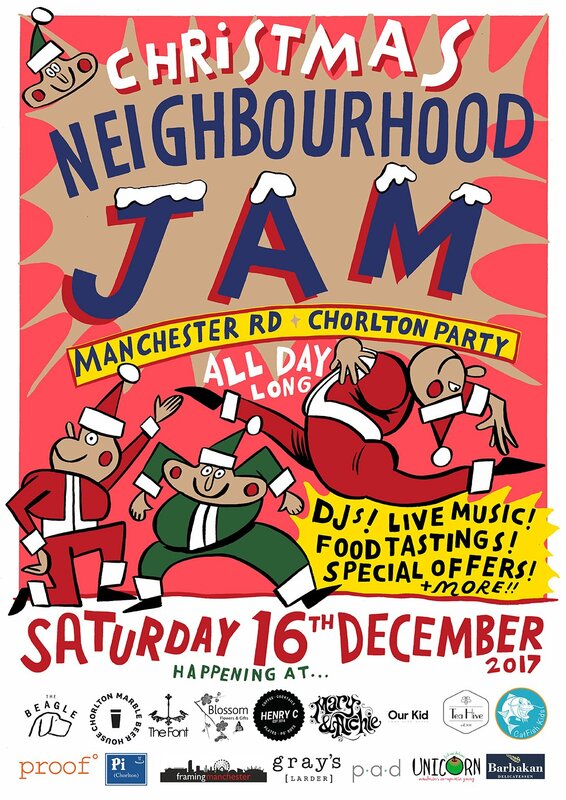 Every once in a while, the businesses along Manchester Road in Chorlton join forces to throw a Neighbourhood Jam – basically a mini festival with everyone putting on something special to create a party atmosphere along the street. This year, there’ll be a Christmas Neighbourhood Jam in mid-December. The event will run all day long and feature DJs, live music, food tastings, special offers and more. Businesses taking part include The Beagle, Marble Beerhouse, Blossom Flowers, Tea Hive, Pi, Gray’s Larder, Unicorn and Barbakan. No word yet on whether there’ll be a Chorlton Christmas Lights event in 2017. In recent years, we’ve had the Beech Road Christmas Lights Switch-On which features a lantern parade by local schoolchildren led by Father Christmas. The procession winds its way from Beech Road Park at around 545pm over to Beech Road, passing rows of children, parents and friends on the way, to Chorlton Green for the Christmas lights switch-on proper at approximately 615pm so there’s no hanging about. A free event, there’s usually a church choir, carol singing, mince pies and mulled wine to keep people entertained. Chorlton has a huge variety of bars and restaurants, and you can be sure that plenty will be organising special events and offers in an attempt to draw in paying punters on New Year’s Eve. If it’s a free event you’re after, though, one of the most popular places to go is Chorlton Green. Organised by the Horse & Jockey pub, the Chorlton New Year’s Eve Party typically features an impressive fireworks display. In previous years there’s also been a New Year’s Eve menu and bubbly on offer inside for those happy to spend a few quid to see in the new year in style. Do you send out email updates please ? Sorry, just seen below. Please will you add me to your mailing lists?